Lafayette Congressman Charles Boustany's PROTECT Act to help the Louisiana seafood industry has been signed by President Barack Obama. Boustany says this legislation will give domestic seafood a fair shot at competing against foreign imports who up until now have been able to undercut our producers using illegal practices. We're getting into the thick of Lent, and seafood is in high demand. Fortunately, most species are in plentiful supply right now. Aside from the good new coming out of crawfish country, Louisiana Seafood Promotion and Marketing Board vice-chairman Chalin Delaune says shrimpers are doing real well, and oysters are surging. Read more about See food? Seafood? Forget winter, spring, summer and fall. 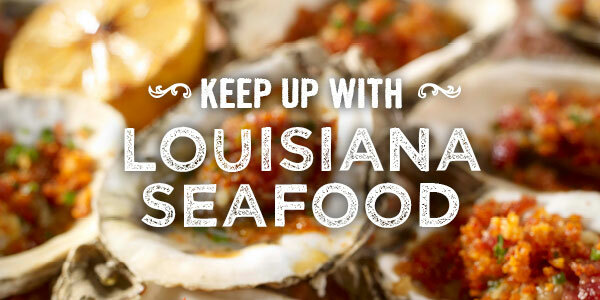 In Louisiana, we can tell what time of year it is based on what seafood is freshest. ♦Launched in June 2014, CRCL’s Oyster Shell Recycling Program recycles shell from participating New Orleans-based restaurants and uses that shell to restore oyster reefs and shoreline habitat across Coastal Louisiana. Changes to the Louisiana Wild Seafood Certification Program aimed at boosting participation in the program is drawing support from The Louisiana Department of Wildlife and Fisheries. Under the marketing initiative, local seafood can be easily identified by the labeling but some found the program's requirements to be too strict to follow. Lt. Governor Billy Nungesser is inviting chefs to participate in the 9th Annual Louisiana Seafood Cook-Off at the New Orleans Wine & Food Experience in the Ernest N. Morial Convention Center. This premier cooking competition, presented by the Louisiana Seafood Promotion and Marketing Board in partnership with the Louisiana Restaurant Association, will take place at 6 p.m. Saturday, May 28. Despite early season, seafood plentiful for Lent! Read more about Despite early season, seafood plentiful for Lent! Lt. Governor Billy Nungesser invites chefs to participate in the 9th Annual Louisiana Seafood Cook-Off at the New Orleans Wine & Food Experience in the Ernest N. Morial Convention Center. This premier cooking competition, presented by the Louisiana Seafood Promotion and Marketing Board in partnership with the Louisiana Restaurant Association, will take place at 11 a.m. Saturday, May 28. Today, the National Ocean Council Committee to Combat Illegal, Unreported and Unregulated Fishing and Seafood Fraud announced its proposal for creating a U.S. seafood traceability program — the next step the U.S. government is taking to ensure that global seafood resources are sustainably managed and not fraudulently marketed.